Canton Village Quilt Works | Kaffe HST Quilt... Pieced, Quilted, Bound, and Complete! Kaffe HST Quilt... Pieced, Quilted, Bound, and Complete! As promised, I am back with some Kaffe goodness. If you remember THIS post, I had completed just the top. Well, I am now completely done with this quilt and I just LOVE it!! The color, the design, just everything. So I wanted to share my quilt joy with you. I hope you like it as much as me. We had a rather sunny day so I took advantage of the good lighting and took the quilt outdoors. Here is the quilt draped across the deck railing. A close up of the quilting. I just love the little ribbon inside the feathers. It was fun quilting this quilt. For the backing, I chose Kaffe's Asian Circles. It really just called for this print, as all the colors from the front of the quilt are present. For the binding, I also chose Asian Circles, just in a different color way. The binding needed to be darker to set the front of the quilt apart from it. More of the quilting. You can see in the colors, I just quilted 1/4 inch in from the edge. I think that was all it needed. The completed top. It will hang in my upper hall, just outside my studio for a while. My hubs asked me not to sell it just yet. But I am not sure that I want to anyway. 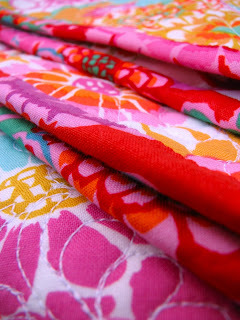 I think the name of this quilt will remain "Riot of Color". What do you think? I hope you enjoyed this Kaffe filled post! Next time, I am going to need your suggestions on a new project. I hope you will help! Don't forget to click HERE for more Kaffe goodness.